"This third book of the Essene Gospel of Peace is a collection of texts of great spiritual, literary, philosophical and poetical value, created by two powerful, interwoven streams of tradition. Chronologically, the first is the stream of traditions to which the Hebrew people were exposed in the Babylonian prison, dating from the Gilgamesh Epics to the Zend Avesta of Zarathustra. The second is the stream of traditions flowing with poetical majesty through the Old and New Testaments, dating from the ageless Enoch and the other Patriarchs, through the Prophets and on to the mysterious Essene Brotherhood. 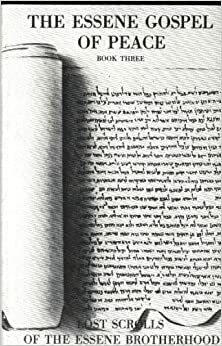 In the buried library of the Essene Brotherhood at the Dead Sea, where the greatest number of scrolls were found, the texts of these two streams of traditions were very much interwoven. They follow each other in a strange succession: the powerful cubistic simplicity of the first juxtaposed with the majestic, expressionist poetry of the second. The original texts of this collection may be classified into three approximate groups: about seventy percent of them are completely different from the ancient Sacred Books of the Avestas and the Old and New Testaments; twenty percent are similar, and ten percent are identical..."